High tunnels, also called high hoops or hoop houses, are temporary structures that extend the growing season. These covered structures are constructed in the field in order to protect crops from the weather (rain, wind, cool or warm temperatures) and, in some cases, pests. High tunnels offer an intermediate level of environmental control—a growing system between row covers and greenhouses. In comparison to greenhouses, they are unheated, provide less climate control, and are less expensive. 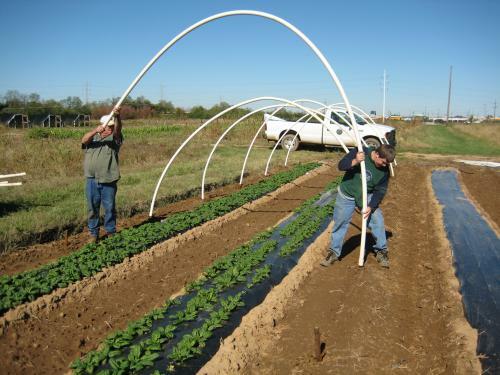 This article lists publications and videos on high tunnel construction. Once these issues have been addressed, the next step is to learn about the diverse designs and materials available and select those that best fit the purpose, budget, and location. Design and construction of the Penn State high tunnel. W. Lamont, M. McGann, M. Orzolek, N. Mbugua, B. Dye, and D. Reese. 2002. HortTechnology 12(3): 447-443. (Available online at: http://sustainable-farming.rutgers.edu/wp-content/uploads/2014/09/Design_construction_Penn_State_high_tunnel.pdf) (verified 19 May 2011). Protected agriculture in Jamaica: A reference manual [Online]. United States Agency for International Development, Ministry of Agriculture, Citizens Development Corps, and Partners of the Americas. 2008. Available at http://hightunnels.org/wp-content/uploads/2013/06/Training_Manual_Endorsed.pdf (verified 4 March 2010). Does not contain organic-specific information. Companion Video on YouTube by JA FARMS. J. Newton, J. Glovier, V. Gore, D. Kuennen, University of Maryland Western Shore; W. Moses, JA FARMS. (Available online at: https://www.youtube.com/watch?v=DgUbenZXj0E&feature=related) (verified 4 March 2010). High tunnel production manual, 2nd edition. W. Lamont. 2003. Pennsylvania State University, University Park, PA.
Purchase information at: http://plasticulture.psu.edu/node/115 (verified 4 March 2010). Does not include organic-specific information. High tunnels: using low-cost technology to increase yields, improve quality, and extend the season. T. Blomgren, T. Frisch, and S. Moore. University of Vermont Center for Sustainable Agriculture, Burlington, VT. (n.d.) (Available online at: http://www.uvm.edu/~susagctr/Documents/HighTunnels.pdf) (verified 4 March 2010). Includes organic-specific information, including organic farm case studies. Companion DVD (a 43-minute educational video featuring 6 farms in 5 northeastern states) is available from: http://www.uvm.edu/vtvegandberry/Videos/hightunnelvideo.html (verified 4 March 2010). Materials and construction [Online]. M. Spaw and K. Williams. Hightunnels.org. Available at: http://hightunnels.org/cms/?p=18 (verified 4 March 2010). Hoophouses and high tunnels [Online]. E. Maynard. 2008. North Central Region organic and sustainable agriculture video series. Purdue University, West Lafayette, IN. Available at: http://www.hort.purdue.edu/tristate_organic/hoophouse_hightunnel_2008.html (verified 4 March 2010). Streaming video and downloadable Powerpoint presentations from a 2.5-h workshop on high tunnel construction and use. Information on how to purchase CDs and educational packets. Links to additional resources. Raspberry and blackberry high tunnel production guide. M. C. Heidenreich, M. P. Pritts, M. J. Kelly, and K. Demchak. 2006. Department of Horticulture Publication No.47. Cornell University, Ithaca, NY. (Available online at: http://www.fruit.cornell.edu/berry/production/pdfs/hightunnelsrasp2009.pdf (verified 4 April 2011). High tunnel project [Online]. Department of Horticultural Engineering, Rutgers University. Available at: http://horteng.envsci.rutgers.edu/hightunnels.htm (verified 15 Nov 2018). Step-by-step photo essay on high tunnel construction and preparation; annual research updates; links to additional resources. Figure 1. 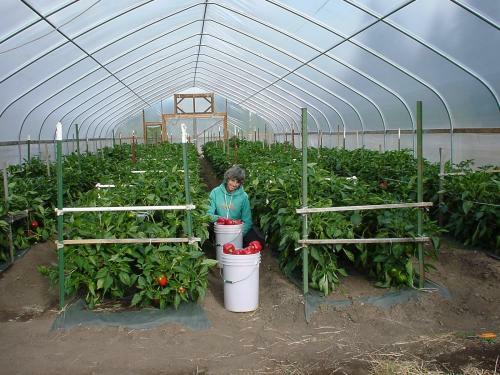 Suzy Evans of Foundhorn Gardens in Oregon shows off her peppers grown in a permanent high tunnel. Figure credit: Robelee Evans, Foundhorn Gardens, Oregon. Construction of a simple PVC high tunnel [Online]. J. Hail, R. Hail, K. Kelly, and T. Carey. Hightunnels.org. Available at: http://hightunnels.org/cms/?p=100 (verified 4 March 2010). The early birds get the returns. Part 2: Detailed instruction for building your very own fieldhouses—only $600-$800 for a 96-ft house—duct tape required [Online]. P. Arnold and S. Arnold, 2008. New Farm. Rodale Institute, Kutztown, PA. Available at: http://newfarm.org/features/0503/arnoldsbuild.shtml (verified 22 Apr 2019). High tunnels: using low-cost technology to increase yields, improve quality, and extend the season. T. Blomgren, T. Frisch, and S. Moore. University of Vermont Center for Sustainable Agriculture, Burlington, VT. (Available online at: http://www.uvm.edu/~susagctr/Documents/HighTunnels.pdf) (verified 4 March 2010). Hoop house construction for New Mexico: 12 x 40-ft. hoop house. D. Jimenez, R. Walser, and R. Torres. 2005. Cooperative Extension Service Circular 606. New Mexico State University, Las Cruces, NM. (Available online at: http://aces.nmsu.edu/pubs/_circulars/cr-606/welcome.html) (verified 4 March 2010). Hoopty-Do [Online]. J. Hanley and T. Hanley. 2008. Kerr Foundation. Available at: http://www.kerrcenter.com/pdf/hoop_house_drawings.pdf (verified 4 March 2010). How-to hoop house construction tips [Online]. S. Upson. Samuel Robert Noble Foundation. Available at: http://www.noble.org/Ag/Horticulture/HoopConstruct/Index.htm (verified 4 March 2010). Low cost high tunnel construction [Online]. T. Coolong. 2009. eOrganic article. (verified 4 March 2010). Figure 2. Low cost, movable tunnel under construction. Figure credit: Tim Coolong, University of Kentucky.